Child's Project Runway Dress and Bolero This special occasion dress from Project Runway features a variety of over skirts, bows and flowers with spaghetti strap or sleeveless dress and bolero. Simplicity sewing pattern. It's So Easy Hat and Scarf Make this great It's So Easy hat and scarf in classic Christmas colors, or in your favorite teams fabric to keep warm during the chilly winter season. Out Of Print Add Ana and Elsa's Frozen Fever outfits to your 18" doll wardrobe. Elsa's springtime gown features beautiful flowered cape and flower for her hair, and Ana's birthday outfit features top, vest and flowered skirt. 18" Dolls Doll wardrobe pattern includes three dresses, two with vests, one jumper with collared shirt, jacket and leggings. Accessory scarves and belts also included. Cupcake Cutie Pie for Simplicity. Make these adorable floppy eared stuffed animals. Pattern includes bear, monkey, lamb with shirts on and puppy and bunny with heart appliques on their shirts. G & G Patterns for Simplicity. Misses' fleece ponchos feature cut and glue, no sew needed techniques and wraps require just a few simple seams for an easy project for beginners. One size fits most. Girls' Plus Tops and Skirts This stylish sportswear pattern for girls is inspired by Project Runway. Pattern includes cap sleeve top, knit crop top, short skirt, maxi skirt, and mini skirt with sheer maxi overlay. Sew up these fun sea inspired stuffies. Pattern includes magical mermaid, plundering pirate, snarling shark, and floundering fishies. Abby Glassenberg Designs for Simplicity. Open your imagination to these mystical fantasy doll clothes for 18"" dolls. Pattern includes four dresses, two capes, two pairs of wings, boots, leggings, and four head pieces. Drake & Ferris for Simplicity. Get this stylish pattern to update your wardrobe for anytime of year. Pattern features mini dress or tunic with cold shoulder and trim options, and top, mini dress or tunic with a lace or mesh back panel. Child's and girls' pattern includes short sleeve top, long sleeve top with peplum or ruffle hem, trousers in two lengths, and patchwork skirt. The Scientific Seamstress for Simplicity. Any child will love these cute raccoon, fox and owl and monster girl and boy stuffed animals. Ruby Jean's Closet for Simplicity. Clothes for 18" doll include top, leggings, tutu, dress, underskirt and two headbands. It's So Easy by Simplicity. Leanne Marshall's easy to sew long sleeve dress features optional galloon edge lace at sleeve and draped skirt. 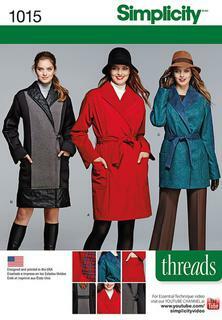 Pattern also features back zip and buttoned cuff. Leanne Marshall for Simplicity. Out Of Print Misses' knit accessories include head and neck warmer that can be worn in two ways, slouchy hat, ear warmer, scarfette, short and long fingerless gloves that button together so they don't get lost. Leslie Asch. Frozen Coronation Day Costumes for Children It's coronation day in Arendelle! These adorable costumes for children include both Anna and Elsa's beautifully adorned coronation gowns. Simplicity sewing patterns. Description: DISNEY FROZEN ANNA AND ELSA - DOLL CLOTHES PATTERN 11 1/4 " FASHION DOLL CLOTHES Also known as S0734. Out Of Print These stylish scarves and cowls feature innovative fleece techniques that will keep you warm and cozy during harsh winter weather. Shirley Botsford for Simplicity. Description: Rag Quilted Monster Pillows These cuddly flannel rag quilt pillows are anything but scary with their adorable friendly monster faces. Vintage party and play clothes for 18" doll. These dresses, tops and jumpers are inspired by patterns from the Simplicity archives. The Dollies' Dressmaker for Simplicity.